At Vero Dental Spa, we pride ourselves on providing the most reassuring, reliable and highest quality patient care possible. In order to do this, we believe it is necessary to give our patients as much information as possible about their choice of treatment, so that they can feel reassured and informed ahead of their appointment. Here are some of the most frequently asked questions about smile makeovers. A smile makeover is the term given to one, or a combination of, cosmetic dental procedures meant to make your smile more beautiful. This can include treatments such as porcelain veneers, cosmetic porcelain crowns, fixed porcelain bridges, and even dental implants. Am I a Suitable Candidate for a Smile Makeover? Anyone who wants to improve the appearance of their smile would love a smile makeover! Candidacy for a smile makeover really depends on the exact choice of treatment that you would like. Patients will always be asked to attend a consultation appointment with one of our qualified and experienced team members, who will undertake a comprehensive physical examination of your mouth and teeth, and ask you about your oral and medical history. It may also be necessary for you to attend an appointment to get x-rays or a CT scan of your mouth and jaw to determine if your choice of treatment is possible. Are There Non-cosmetic Benefits of a Smile Makeover? 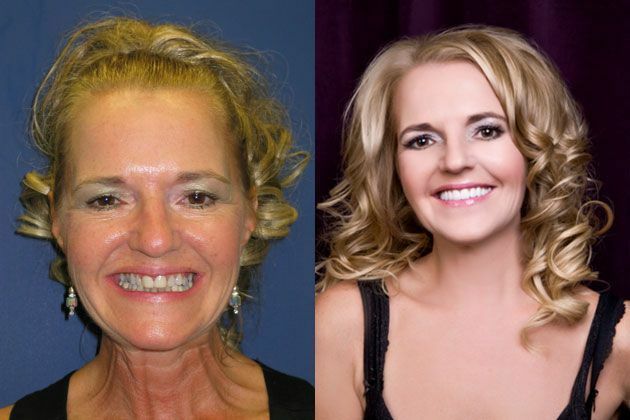 Contrary to popular belief, a smile makeover can offer a lot more than just a transformed appearance. Having good teeth and a beautiful smile can be beneficial in other ways including boosting your confidence and reducing your stress levels. Procedures such as porcelain crowns and dental implants can improve your oral health, which has also been shown to benefit your general health and wellbeing. Many procedures can also improve the function of your mouth too, such as filling the gap left by missing teeth with dental implants. How Many Appointments Do I Need to Attend to Complete My Smile Makeover? Each smile makeover is completely unique, and the number of appointments that you will need to attend will depend on which procedures you choose. You may be given an approximation during your consultation, but you should bear in mind that this is only a guideline. It may be possible to complete your smile makeover in less appointments, or you may require additional visits to achieve your desired result. Will My Insurance Cover the Cost of My Smile Makeover? Again, this can vary from patient to patient. However, because most smile makeovers are deemed as ‘cosmetic’, if they are covered at all by insurance, it is usually only a very small part of the cost. We recommend that you speak to your insurance company and check your policy carefully before committing to any procedures. However, we do have many financing options available, meaning that a smile makeover is available to virtually any budget. If you would like to discuss financing your smile makeover, call our office, and we can answer all of your concerns.